Nigerian singer, D'Banj and wife Lineo Kilgrow on Sunday lost their only son, Daniel Oyebanjo, who wandered off and fell in a home swimming pool, on being rushed to hospital, little Daniel was no more. At the time, the Oliver Twist singer was in Los Angeles attending the BET Awards. Nigerian singer, Oladapo Daniela Oyebanjo aka D' Banj, 38 and his wife Lineo Didi Kilgrow have lost their son, Daniel Oyebanjo lll, who made one year last month. The Naija singer was in Los Angeles attending the BET Awarding ceremony when the incident occurred. "Trying times, but my God is Always and Forever Faithful." Little Daniel wandered off to the home swimming pool which did not have safety barriers. In the pic above, D'Banj is seen walking past the swimming pool with Daniel. "A pool indoors and your baby passing by the pool..hmm please be careful, tell your wife and caregivers to keep an eye on him..."
"You'd need to cover the pool in a few months." "Ensure you put a door to your pool arena for safety of your child so he doesn't wander there alone." The body was taken to the mortuary. Meanwhile, Police on Monday visited their home in Lagos, but no one was there. D' Banj and Lineo are expected to report the circumstances that led to the death formally to the police once they are done with the mourning. Yemi Alade, Davido are some of the celebrities that have sent condolence messages. Five weeks back, fans advised D'Banj to try and put safety barriers around the swimming pool now that there was a child in the home. 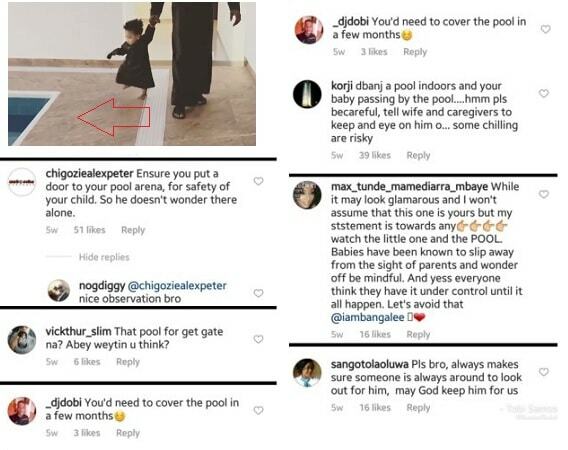 Five weeks back, D Banj shared pics of the pool and some fans expressed their concerns over the lack of the safety barriers. Below is a short clip of D'Banj and his son walking past the swimming pool where little Daniel drowned on June 24. The singer always shared pics of his son and among them was the pic he shared on Father's Day changing Daniel's soiled diaper.